Christy brought this card to her Project Life Greeting Card class Sunday. Isn’t it adorable? It’s so festive – perfect for a celebration card! Remember back in the 70s when we used to hang strings of beads in doorways? That’s what this card reminds me of. 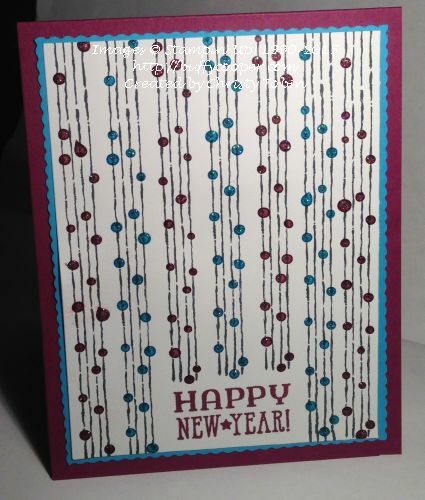 Christy used the Chalk Lines stamp set for the “beads,” masking the bottom of the card for the sentiment. And don’t you love the colors? I’m not sure I’ve ever used Tempting Turquoise and Rich Razzleberry together – but I think this combination rocks. The little beads are dots of Dazzling Details mixed with ink refill. Clever, right? And the sentiment is Six Sayings, a hostess set from the Holiday Catalog. I know it’s a little early for New Year’s cards, but you only have until January 5 to earn the Six Sayings set. It’s $15 in stamping rewards for the wood mount, and $11 for the clear mount, so you can easily earn this set with a minimum workshop or class. Contact me to set a date! We can make greeting cards, tags, or Christmas projects. This entry was posted in Holidays and tagged Buffy Cooper, card making Winchester VA, Chalk Lines, Dazzling Details, New Year, paper crafts, Rubber Stamping, Six Sayings, stampin' up, Stampin' Up! Demonstrator Winchester VA. Bookmark the permalink. Love this card. It is soooo nostalgic. As you say, those bead doorways!